We live just above the redbud line that stretches across the middle of Pennsylvania. But we only need to descend our mountain road and head south a few miles into the rich limestone valleys to see field edges and hillsides of redbud covered with clusters of pea-shaped lavender blossoms that have sprouted along their branches and even their trunks. To me, these small, native, flowering trees represent the most lavish display of spring color, and so late every April we take at least one trip into redbud country. Eastern redbud (Cercis canadensis) is also called Judastree because it resembles a closely-related Mediterranean plant Cercis siliquastrum from which the betrayer of Jesus, Judas Iscariot, was believed to have hung himself. The redbud range extends from Connecticut and southern New York west to Nebraska and south to Florida, Texas, and even northern Mexico. It prefers limestone and diabase soils, which are mostly limited to the southern part of Pennsylvania in creek and river valleys. Redbud Valley is one such place, a narrow valley bisected by Cove Creek and tucked between Scrub Ridge and Dickey’s Mountain. Renamed the Kerper Tract in honor of its former owner, Edmund Kerper, an Ohio-born lawyer and amateur naturalist who bought the property in 1934, it has not only redbuds but an amazing array of spring wildflowers and songbirds along Deshong Trail, an easy, eight-tenth of a mile, loop trail that runs beside Cove Creek through bottomland forest. When Kerper bought the property it was mostly open farmland, but he hired workers to turn it into a sanctuary for songbirds by planting a wide variety of trees, shrubs, and flowers in formal gardens. The birds and other creatures eventually came, but more were attracted when the gardens reverted to a more natural state. As naturalists know today, nature loves messiness. The more overgrown, the better, which is why I heard and saw 22 songbird species during our visit. Wood thrushes sang in the forest, along with scarlet tanagers, ovenbirds, great crested flycatchers, worm-eating and black-and-white warblers. A Louisiana waterthrush sang and foraged beside the creek. I also heard the distinctive, upscale, buzzy trill of a northern parula, one of Pennsylvania’s least common warblers. This lovely, bluish warbler has white wing bars, a yellow throat and breast, and a greenish patch on its upper back and prefers habitat along creeks and rivers that are shaded by large sycamore, hemlock or spruce trees. Yellow warblers, Carolina wrens, eastern towhees, Baltimore orioles, blue-gray gnatcatchers, gray catbirds, white-throated sparrows, and eastern phoebes preferred the shrubby habitat along the trail. I was particularly pleased to see and hear a handsome, golden-winged warbler, his golden wings a contrast to his grayish back and white breast and belly, set off by his black throat and ear patch and yellow forehead. Golden-winged warbler numbers have been dwindling due to the loss of their preferred early succession shrubby habitat as well as competition from and breeding with blue-winged warblers which have been moving into golden-winged warbler territory for years. However, the ridge-and-valley province and the Poconos remain hotspots for seeing the birds in Pennsylvania. I kept my ears tuned for birds and my eyes mostly focused on the ground in search of wildflowers. Large sycamore and tulip trees lined Cove Creek along with an understory of redbuds and a carpet of both white and blue Virginia bluebells (Mertensia virginica). My father had given me a few Virginia bluebell plants from his New Jersey garden before he had moved to Pennsylvania more than 30 years ago, and I had planted them in my yard, which is not the usual Virginia bluebell habitat of forested floodplain. But they thrived and are the first plants returning ruby-throated hummingbirds nectar on. But all my bluebells have pink buds and blue flowers. I had never seen white ones before, although Rhoads and Block in The Plants of Pennsylvania write that they are occasionally white. The delicate pink and white spring-beauties and nodding, pantaloon-shaped, yellow-tipped white Dutchman’s breeches blanketed the steep Scrub Ridge as far up as I could see. By keeping a careful eye on the ground beside Deshong Trail, I also spotted the speckled leaves of trout lilies, which had already bloomed, along with the leaves and occasional flowers of other early bloomers that love a bottomland forest and which I never see on our mountain land — cut-leaved toothwort, wild ginger, and bloodroot. We do, however, have a plentitude of mayapples, jack-in-the-pulpits, and smooth yellow violets, and they were also blooming in Redbud Valley. The small flowering dogwood trees had opened their showy, white bracts that surround their small clusters of greenish-yellow flowers and presented a pleasing contrast to the lavender redbud blossoms. Unfortunately, much of the understory was a tangle of the invasive multiflora rose and Japanese barberry, although the songbirds didn’t seem to mind them. I was especially intrigued by a vine I had never seen before that twined up most of the trees. Dave Scamardella, the forester for the Buchanan Forest District, told me that he hoped to eventually remove all the invasives including the vine, which he identified as creeping euonymus (Euonymus fortunei) or wintercreeper. A native of China, this evergreen vine is “cultivated and occasionally naturalized in floodplain forests,” according to Rhoads and Block. Scarmardella relies on volunteers to help with invasive-removal, but because of the remote location of the Kerper Tract, such volunteers are hard to find. He also told us that Kerper’s will specified that there would not be timbering on the tract except in an emergency. Back in 1971, the Pennsylvania Bureau of Forests had declared an emergency and done some thinning, but we were still impressed by the size of many of the trees, both in the bottomland forest and Dickey’s Mountain, the latter of which we climbed after eating our picnic lunch at a table beside the creek. Surprisingly, the marsh-marigold or cowslip is a native of North America, Europe, and Asia and has more intriguing alternate names than any plant I know of — king cups, water blobs, may blobs, molly blobs, horse blobs, bull’s eyes, leopard’s foot (because of its deeply notched, rounded leaves, I imagine), great bitterflower referring to the acrid bitterness of its leaves, water gowan, meadow gowan, Marybuds, verrucaria, solsequia, water dragon, capers because in Virginia and other places people used to pickle the buds as a substitute for capers, cowlily, soldier buttons, palsywort, water-goggles, meadowbouts, crazy bet, gools, drunkards, water crowfoot, and meadow buttercups, writes Jack Sanders in his delightful Hedgemaids and Fairy Candles. Furthermore, he explains that blob means “bubble,” gowan was Old Norse for “gold,” verrrucaria is a Latin word meaning “cure for warts,” and solsequia is another Latin word meaning “sun-follower” because marsh-marigolds open in the morning and close at night. Drunkards stems from a Devonshire children’s belief that because the flowers drink so much water their scent encourages drunkenness. Marigold probably refers to the Virgin Mary, hence, Mary-gold. But their scientific name Calthia—Greek for cup, which refers to the shape of the flower—and palustris meaning “swamp” in Latin, is the best description of this lovely, swamp-loving wildflower. The 2.2 mile, circular Dickey’s Mountain Trail presented more of a challenge for our afternoon hike as it ascended 400 feet before leveling off. Except for a hillside of bloodroot, most of the wildflowers were the same species that grow on our mountain — early saxifrage on a rocky bank, kidney-shaped buttercups, wild geraniums, perfoliate bellworts, false Solomon’s seals, spring beauties, and rue anemones. I also found rattlesnake fern and a bed of bluets in the middle of the level, lower trail. We were most impressed by the size of the tulip and shagbark hickory trees. This forest has a healthy understory of spicebush and maple-leaved viburnum as well as many tree seedlings and saplings of maple and hickory — and, of course, flowering dogwood and even occasional redbuds. The healthy understory seemed proof that deer hunters were keeping the deer herd under control, although on that overcast day the only hunters we encountered in the forest were searching for “blackies” (morels) and assumed we were too. Would they have understood that we were hunters of redbud, spring wildflowers, songbirds, and a healthy forest — interested in feeding our spirits and not our bellies? At least not on that spring day. Prospective visitors should contact the Forest District Office, Buchanan State Forest, 440 Buchanan Trail, McConnellsburg, Pa 17233 (717) 485-3148 FD02@state.pa.us for an excellent map of the trails and history of the Kerper Tract. This entry was posted in marsh marigold, Pennsylvania Places, redbud and tagged Buchanan State Forest, Kerper Tract. Bookmark the permalink. Thanks. I”m glad you enjoyed it. Great job with the piece on the Kerper Tract/Redbud Valley! We have been swamped with phone calls since it came out. We are planning a bird identification walk with Mike and Laura Jackson of Everett. McConnellsburg — The DCNR, Bureau of Forestry will host an event for the public, Sunday May 2, 2010 at 8:00 am. The event will be held at the Kerper Tract (also known as Redbud Valley) of the Buchanan State Forest, near Big Cove Tannery, seven miles south of McConnellsburg. 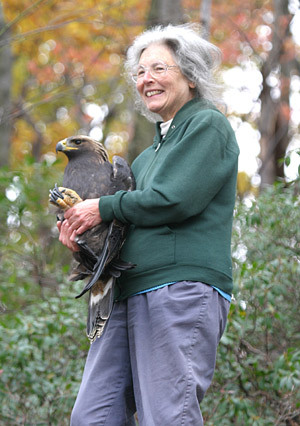 The walk will be led by Mike and Laura Jackson, long-time birders and members of the National Audubon Society. The group will meet at the parking area along State Route 928 near the new footbridge over Big Cove Creek at 8:00 am. The event is free and participants should dress appropriately. Participants may want to bring binoculars and a field guide. The walk may last up to three hours and all age groups may participate, as the walk will be moderate. I’m glad my article has brought so much attention to Redbud Valley. I hope it leads to more volunteers for the area too. Thanks for the comment. Great job on this most recent post. I love taking virtual tours with you. Wish we had redbuds here in central New England. People often plant them as ornametals and they seem to do OK thanks to climate change (not a good thing). Add one more common name to the marsh marigold list-cowslip, the most common name in New England. Can’t image why they call it that unless cow’s actually slip on it, but as you know common names are often a mystery. Thanks, Bill. Yes, I should have included cowslip. Apparently, it is the New England name for marsh marigold. Cowslip means “cow slop,” or dung and is the English name because the cowslip grows in meadows and pastures along with the cows, but the true English cowslip is actually a primrose. Go figure. Now that settles a riddle that I have long been curious about. “Cowslop” makes perfect sense. Thank you.